In response to this question, I have to say that I am also unable to guess people’s real motivations as I see many people, organizations, companies, stores, and restaurants buying flowers and gift baskets as presents for the international New Year or the recent Lao New Year, which raises this question. Gifts and bribes appear similar on the surface but the difference is that the motivation of the giver and receiver of a gift is based on mutual love, respect, and understanding and this takes place at weddings, births, housewarmings, company openings, birthdays, and such like. 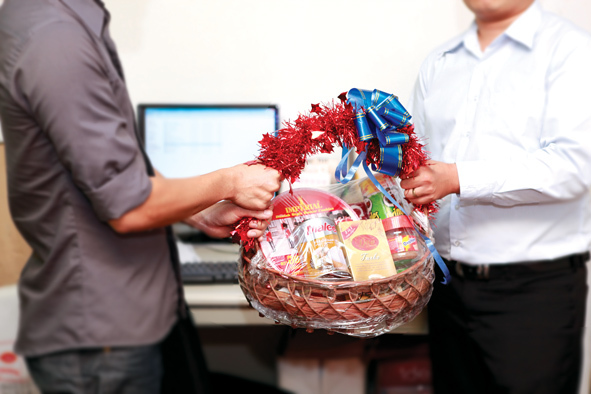 This custom of giving and receiving gifts at various occasions has been part of our fine Lao traditional culture since time immemorial and should be preserved. The giving of bribes, however, differs from the giving of presents completely in that the motivation of the giver and receiver is different, as are the surrounding circumstances. In order to gain a full and correct understanding, I would like to raise Article 157 on Bribery and Corruption of the Penal Code, which states that: Any civil servant claiming, requesting, accepting or agreeing to accept a bribe in exchange for using [the civil servant’s] position for the bribing party’s interest shall be punished by one to three years of imprisonment and a fine equal to the amount or value of the bribe. Article 157 of this Law prohibits and deters violators by incarceration and fines, which are heavy penalties. 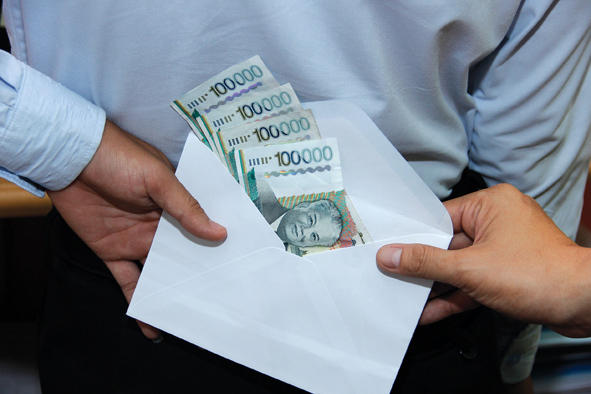 I am therefore of the opinion that the giving and receiving of bribes is bad for society and seeing as there is a law to control and bring an end to such activities, all members of the public, especially those working in related sectors, must respect and comply with it strictly so that this cancer may be eradicated from Lao society for good. ??????????? ?????????? ?????????????????????????????????????. ??????????????? , ?????????????? , ??????? , ????????????? ???????????????????????? ??? ???????????? ???????????? ??????????????? ??????????????? ??? ???????? ????????????????????????????? ???????????????????????????????? ?????? ??? ?????????????????????? ? ??? ????????????? ??????? ??? ????????????? , ????? ????????????? ?????????????????????????????. ???????????????????????????? ???????????? ??????. ??????????????? ??? ??????????????????? ??????????????????????? , ????????? , ???????????????????????? ??? ???. ??? ????????????? ???????????????? ???????????????? , ???????????????? (????? ), ?????????????? ?, ????????????????? ??? ????????????????????????…. ???????????? ??? ???????????????????????????? ?????????????????????????????????????????????????????? ?????????????????????. ???????????? “????? ?“ ???????????????????????????????? ???????????? ????????????????????????? , ????????????????????????? ?????? ???????????????? , ????????????????? ??? ??????????????????????. ????? 157 ???????????????????? ??????? ??? ?????????????????? ???????????????????? ??? ???????? ????????????? ?????????????? ??????????? ?????? ??? ???????????? ???????????????????????????? ??? ??????????????? ????????? ??? ????????????????????????? ?????????????? ??? ????????? ?????????????????????????? ?????????????? ??? ??????????????????? ????????????????????????????????????????????????????. Re-published with permission of Target Magazine. See original article here. Hi, its fastidious piece of writing about media print, we all know media is a wonderful source of facts.